Sri City, January 30, 2019:- The Confederation of Indian Industry (CII) in collaboration with Sri City organised a workshop on Rooftop Solar Power Solutions, in Sri City on Wednesday. Delivering the welcome address, Mr. Satish Kamat President, Sri City (Operations) said that rooftop solar is the key solution to contemporary power needs, and it is a feasible solution for industrial consumers to ensure reliable and quality power. He urged the delegates to actively interact with the experts for any specific requirements. 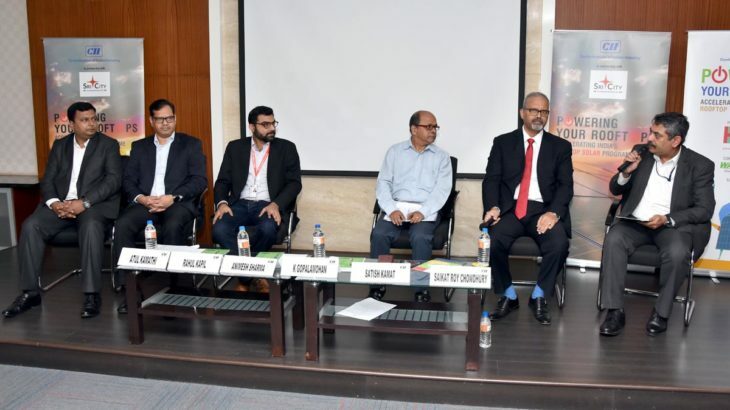 Mr. Animesh Sharma of Hero Futures Energies and Mr. Bhujanga Rao Koka, of Mondelez India Foods presented their experience and advantages of using solar rooftop power for the needs in their companies as case studies. About 60 senior executives from some of the operational units of Sri City attended the workshop.